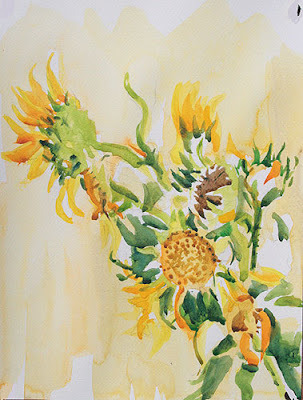 I’ve been watching a field of late flowering sunflowers. Normally all the sunflowers are harvested by the end of July, and then afterwards, sometimes there might be a random second flowering of the self-sown seeds scatttered here or there. I call this type of sunflower a ‘straggler’. 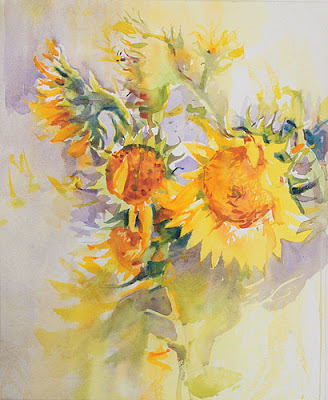 These stragglers are more like a rudbeckia than the comtempory agricultural sunflower (which may well have cause Vincent a problem or two if he were to try & fit ‘Twelve Sunflowers in a Vase’ such in the National Gallery, London…). They have a much smaller head of seeds, their petals are more beserk & wind blown and best of all are their long, star-fish like sepals. Yes the sepals of these stragglers are really something. What’s more, they do not have one large flower head but several smaller ones, gourmands that grow on sub-branches from the central stem. Anyway, this year, with the cold rainy July & August, the sunflowers have been rotten. My farmer-friend had to plough a whole field back in the beginning of June, because of the wet spring, which brought on massive attack of slugs who ate the seeds. I rounded up these stragglers on a late, wet day in september, the brave last trumpets of summer. How could I not have a soft spot for them, me who went to live in the land of the sunflowers?